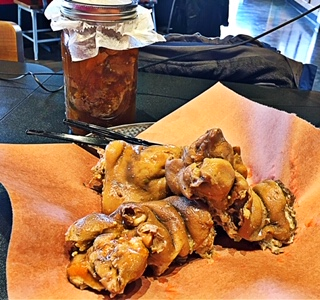 Ever see those pigs feet sitting in their own juice in a jar at the store, and wondered…who eats these and why? We asked Lake’s Metro Deli, who brines their own feet, to give us the skinny on these…and they did, but laid a plate of them down in front of us. I don’t want to do this…not at all. This is our house made pickled pigs feet in a jalapeño brine. We do a little extra sugar to counteract the heat, give it a nice sweet-heat flavor. Now these look just like feet…because they are! Our “Trotter” is like a croquette. It’s braised pigs feet, has fresh thyme, and black cracked pepper, and then we have a house made honey mustard and charred green onion sauce to go with those. Lake is an excellent chef, so I trust him and I’ve had pig knuckles at Germania before…and they were actually really good; but just looking at the little piggie toes is seriously grossing me out! I’m just gonna…I’m just gonna go for it. Oh, it’s so grisly feeling on the outside. Which, chicken skin I guess doesn’t normally bother you. It is very tender, I’ll say that, I really didn’t need to use the knife. I’m usually not this nervous about these things. I don’t really want to put pigs feet in my mouth either. Okay, that’s not bad….especially with the brine, the jalapeno brine is actually really good, but the texture is just strange. I’ve got to get these out of my face. Good flavor, very tender, I don’t know that I’m “sold”, that I will ever order those…ever, or buy a jar from the butcher shop. It’s not the flavor, it’s just the knowledge. I was warned that the texture is a little “mushy” on the inside, so it can be a shock if you’re not warned. You’re right, it is mushy, so I’m glad she warned me. Crispy on the outside…and I can taste a slight ham flavor with that jalapeno brining. Now, I would eat these, just don’t tell me they’re pigs feet. I don’t know how to feel about it. You can try pigs feet, just like we did, at Lake’s Metro Deli. I know, I know, I didn’t make them look good…but my friend and fellow foodie, Brian Buxton, loves them! If you see something we should try…a new video game, new trending toy, challenge, or adventurous food item…tell me about it on my 44News Facebook page.